Elsewhere Theo Walcott makes his return to the Emirates and Antonio Conte aims to quell Chelsea’s woes away to Watford. Alexis Sanchez failed to record a shot on target against Tottenham midweek. ALEXIS SANCHEZ CUT an isolated figure at Wembley on Wednesday evening as his new club slogged towards a bitter 2-0 defeat to Tottenham. The Chilean was the marquee signing of the January transfer window the but failed to make a lasting impression during his Premier League debut. 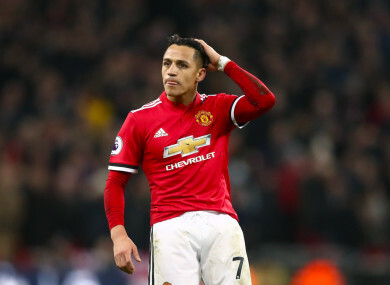 Sanchez succeeded in recording an FA Cup assist on his debut against Yeovil Town but failed to manage a single shot on target during Wednesday’s loss in London. It was the first time the forward had failed to do so all season, with the magnitude of both the game and the fact that it was his first chance to impress a worrisome indicator. Some have pointed to the system employed by manager Jose Mourinho as restrictive to the explosive, quick nature of the player. Both the player and manager alike will be keen to show his worth against Huddersfield at Old Trafford. United suffered their first defeat of the campaign away to David Wagner’s side back in October. It was a defeat which showcased the gap in class which exists between themselves and league leaders City, but with Sanchez on board and second place still in their grip, United will be keen to demonstrate they have much more in their armoury to display in the months ahead. Manchester United’s midweek flop at Wembley means Pep Guardiola’s side can extend their lead at the top of the Premier League to a massive 18 points this weekend with a win against Burnley at Turf Moor. The league leaders’ momentum shows no signs of letting up as they remain on course for a potential quadruple in 2018, facing into the last sixteen of the Champions League alongside a EFL Cup final on top of remaining in contention for the FA Cup. City secured the services of Aymeric Laporte during the January transfer window and made it 22 wins from 25 with a 3-0 win against West Brom. With just five games coming their way in February, they will want to put as much distance between themselves and United before the priorities of a deep Champions League campaign take centre take. It has been largely a dream start to life in blue for Theo Walcott. The forward bagged a brace against West Brom midweek on a night where things seemed to just fall into place for Everton, with Seamus Coleman also making his long-awaited return on the night. Walcott drifted apart from Arsenal over the course of the last number of seasons but showcased on Wednesday the potential he still possesses as an attacking threat. Toffees boss Sam Allardyce claimed two weeks ago that his side needed to play “more boring football”. Walcott will likely not provide that, but will bring to the table a renewed speed, energy and clinical edge to a side lacking in the goals department in recent months. He will return to the Emirates on Saturday and face a warm reception for a much-loved player who had given over a decade of service to the Gunners’ cause. The player will turn 29 next month and enters the twilight of his career with a tinge of regret of what might have been under Arsene Wenger as the years went on and on with the charge of potential unfulfilled labelled against him. Walcott’s brace against the Baggies showcased there is still that same energy and hunger in him. He will be keen to show his old employers what he is capable of on his day. Tottenham were in alluring dreamland after just 11 seconds against Manchester United on Wednesday after Christian Eriksen slipped a fine finish past David de Gea to send Wembley into raptures before many fans had even taken their seats. They swept Jose Mourinho’s side away with an accomplished display which overshadowed the Premier League debut of Alexis Sanchez, with the evening turning almost embarrassing when Phil Jones scored an own goal to double the hosts’ lead. The win meant Mauricio Pochettino’s side have suffered just one defeat in their last 14 outings in all competitions; a loss which can perhaps be forgiven against runaway league leaders Manchester City. This competitive run of form means Spurs can now overtake Sunday’s opponents Liverpool were they to secure their seventh win in 10. Jurgen Klopp’s side became the first team to beat City all season but soon relapsed into a state of despair with back-to-back defeats against relegation-threatened Swansea and West Brom in the FA Cup at Anfield. A comfortable 3-0 win against David Wagner’s Huddersfield midweek has aired a certain level of calm. Klopp will need to firmly quell this current tide of unease, however facing an in-form Tottenham side hot on their heels will be no easy feat. Lose, and they will drop below their opponents into fourth place at best. Suffer defeat combined with a Chelsea win on Saturday and the Reds will drop out of the top four. Like Liverpool, January has not been an enjoyable month for Chelsea. The Premier League champions suffered four draws on the hop in all competitions, exited the EFL Cup, narrowly overcame Norwich on penalties in the FA Cup and were spanked by Bournemouth 3-0 at Stamford Bridge. The January transfer window runaround will only have added to boss Antonio Conte’s stress levels, but like Arsenal and Borussia Dortmund, he will be happy with his lot — bringing in Olivier Giroud and seeing Michy Batshuayi depart on loan to the Bundesliga. The Italian at last has a backup option to Alvaro Morata up front and in Giroud has a bulky, traditional striker who is proven to score close to 20 goals in the Premier League each season. All that’s left to do now is get on with matters on the pitch, which is easier said than done. A tough February takes in games against Barcelona and Man United, before March begins with a trip to the Etihad. Watford, under the stewardship of Javi Gracia, will present an achievable win as the Blues face into a heavy couple of months ahead. Conte is unlikely to remain at Stamford Bridge beyond this season but knows he needs to ensure Chelsea’s place in the top four if this season is to stand any measure of credibility. Email “All eyes on Sanchez, Spurs look to overtake Liverpool and the Premier League talking points”. Feedback on “All eyes on Sanchez, Spurs look to overtake Liverpool and the Premier League talking points”.